I’m sure there are other photos of the exterior of The Auburn Stadium around. I just don’t think I’ve seen one. But there it is, at least the west side. Looks like the letters are in that Toomer’s Drugs font (they’re expecting a visit from everyone of you). Pretty interesting. Even more interesting? THAT STAT IN THE CAPTION. Again, this may be some call-in show trivia standard I just never internalized or came to terms with it and blocked out… BUT 32 ROAD GAMES IN A ROW? 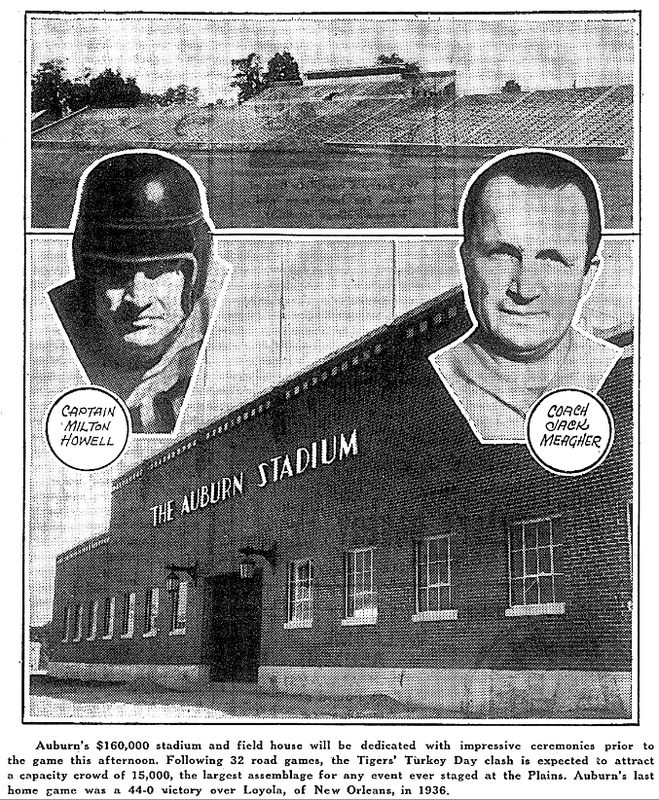 Yep, that’s what 15,000 Auburn Stadium, which first opened for business for Auburn’s 1939 homecoming game against Florida, got for us: OUR FIRST HOME GAME IN THREE YEARS. The man who thankfully—it kept us from losing—scored Auburn’s first (varsity) touchdown up in that thing? Babe McGehee. Here’s a letter his friend wrote to him congratulating him on the accomplishment. It’s kind of awesome. Related: Auburn’s first homecoming may actually have been 104 years ago—and America’s first.